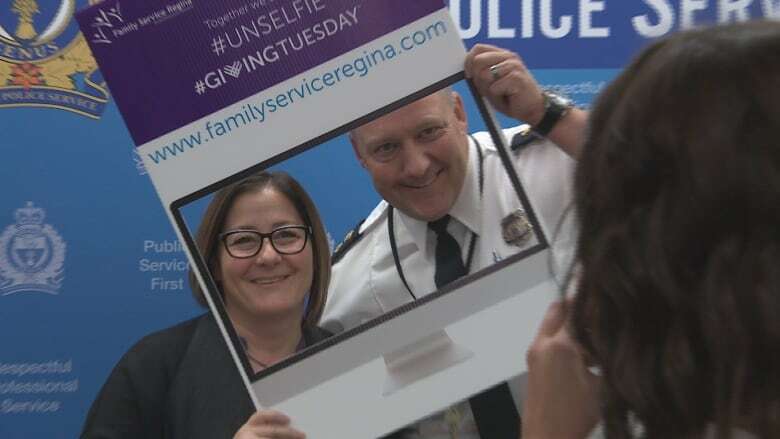 The Regina Police Service and Family Service Regina are partnering up. Their goal: to increase awareness and raise funds for the agency, which provides support for victims of domestic violence. After Black Friday and Cyber Monday comes Giving Tuesday, a national day of giving back. Family Service Regina is taking the opportunity to at least get people talking about the services they provide. "We provide a number of services working with individuals, children and families," said Shellie Pociuk, CEO of Family Service Regina, which has been in the community for 85 years. "We have a variety of counselling services, we offer a number of domestic violence victim services and groups." On Giving Tuesday, anyone making an online donation to Family Service Regina will be asked to keep the giving going. "Using the hashtags, #GivingTuesdayCA, #TogetherWeCan and #UNSELFIE, they can encourage friends and family on their social media networks to give and to share photos or stories of friends and loved ones while encouraging our community to support a cause that's sole dedication is creating a healthier Regina," said Carissa Trenton, Communications & Fund Development at Family Service Regina. Saskatchewan has the highest rate of police-reported partner violence in Canada. Regina Police Chief Evan Bray says they deal with domestic violence calls every day. "Just like any call we respond to, we're responding and we're intervening at the point of crisis," said Bray at police headquarters. "So often that's our worry when you step into a situation like that and you're dealing with the result of a crisis. You could be seen as just putting a Band-Aid on it but you haven't done anything to address the root cause of the problem." Which is why the police chief is encouraged about their relationship with Family Service Regina. The agency provides wraparound support, so ultimately RPS may not have to intervene in a crisis situation in that household again. "Our vision at the Regina Police Service is working together to keep Regina safe. This is a perfect example of where we can work together." The agency is hoping to raise $5,000 through online donations. The funds go directly to supporting the victims and families and to support Regina Family Service staff.